“Off-grid guy” Michael Mobbs is so frustrated by the poor performance of his off-grid system in inner Sydney terrace house that he has decided to junk it and is calling for new proposals. It is a salutary lesson for others wishing to follow. Michael Mobbs has been involved in sustainability for more than two decades, leading public discourse with his “sustainable house” blog, cutting his connections to mains water and sewer more than two decades ago, and finally cutting the electricity wires to his inner-Sydney terrace home in March, 2015. That’s where the grid used to connect. His exploits and determination to lead a self-suficent lifestyle earned him the sobriquet of the “off-grid-guy”. But two years after cutting the link to the electricity grid, Mobbs is deeply frustrated – his off-grid system is not working anywhere near as well as he expected. For the last few weeks, in cloudy, rainy Sydney, Mobbs has had to turn off the fridge during the day to ensure that the house, which he shares with two others, has enough power for a “civilised life” at night-time. Worse than that, his system has a bug in it that causes it to trip every two days. Flashing digital lights have become part of his life. Mobbs in now looking to replace the system, and has even launched a public ‘invitation” for people to suggest solutions. (Submissions are due on April 13). But he wants this to be a public discourse, because from his experience he sees a cautionary tale for anyone looking to install battery storage, and particularly those who are looking to go off grid. Although battery storage has been used for decades, mostly in remote areas that don’t easily connect to the grid, the mass-market is new, and so are many of the products now available to those in the inner city, suburbs, and regional towns. And battery storage is a complex business – it relies so much on the consumer’s usage pattern, available solar power, local weather, orientation and how it is configured and paired with other hardware and software such as inverters and solar panels. Going off grid requires a bespoke solution. Some people have the money and can throw surplus dollars and capacity at the solution. Hobbs clearly wants to find a smarter way – and in the inner city, he is restricted by space. Mobbs says that from his experience it is pretty clear that there is a consumer blind spot. He now emphasises the need to be clear about what is wanted from the system, and for good monitoring and analytics to indicate what is going wrong and when. So what did go wrong with his system? In 1996, Mobbs had solar panels installed, a 2.2kW system. In 2015, with a view to going off grid he upgraded his solar system to 3.5kW of solar panels, and installed 15kWh Alpha-ESS battery storage system with a 5kW Goodwe inverter. In all, it cost him $27,000. At first glance, that looks about right. But it’s the detail that counts. Battery storage experts told One Step that Alpha and Goodwe are both good technologies, but they are best suited for “hybrid systems” which provides storage of excess solar capacity and back-up in case of a blackout. They are not the best option to be off-grid. Mobbs also admits to not fully understanding the way that off-grid systems work. This graph (below) is an illustration. It shows the promised solar power (orange line), the actual panel output (green line). It’s a huge difference, but it simply reflects the fact that when a battery unit is filled, any excess solar capacity is “spilled”, because there is no grid to send it back to. So the solar output needs to be carefully configured with usage and battery storage capacity. Some spillage is inevitable – unless you want to overspend on storage – because that is the nature of the beast. Mobbs reckons that with the extra 1kWh of available power he had expected he could “potter along”. He tells One Step: “So now I have not got enough. This month of rain in Sydney has given me over the horizon radar … it’s like Game of Thrones, winter is coming. So Mobbs is looking to replace this set up and get a new inverter and battery storage. But he wants to make a few points clear about his experience, and the lessons to be drawn from it. The biggest lesson, he says, is the importance of data. And data is important even for those who just have solar panels – some studies have shown that more than one third of all solar systems (there are 1.6 million rooftop solar systems in Australia) are working below par, often for some easily fixed fault, but the households simply don’t know. “It’s not enough to say that we have got a lot of solar households in Australia. We have got to be able to say that they are delivering on their promise,” Mobbs says. Other issues he has come across is the lack of a formal second hand market in solar panels. When he took down his original array, the installer didn’t know what to do with them. But soon enough, Mobbs found someone in the Blue Mountains who hopped in his ute to drive down and pick them up. He also wonders why there is not more recycled metals used in such systems. Marlon Kobacker, of Sustainable Future Group, which has reviewed Mobbs’ problems, believes there must have been some communication break-down when the equipment was ordered. He says Mobbs has sized the system for around two or three days, when most people might size it for a week. And he doesn’t want a fossil fuel back up generator. “In running the EOI process we doing now for either repairing or replacing system we are taking approach that we need be very clear with the brief up front. “We want to get certainty round how system will perform, on the predicted output, and much better data interface … and to get smarter controls, load controls, and so at least there can be some sort of alarm when the system is heading towards a shut-down. This article was originally published on RenewEconomy’s sister site, One Step Off The Grid, which focuses on customer experience and ambitions with distributed generation. To sign up to One Step’s free weekly newsletter, please click here. The data in the graph looks accurate. He seems to be using about 5kWh per day. So about 60% of the generation is going to be wasted. The system design seemed to be based around having the large amount of panels compensating for the small battery size. Unfortunately, the system has been caught out by an unusually long run of bad weather. You can probably expect this to occur once every 3 or 4 years in Sydney. It’s really good design having a large amount of panels and comparatively small battery, because the panels are cheap with a 25 year warranty and the battery is comparatively expensive with an at best 10 to 15 year warranty. So the issue is inadequate solar harvest to power minimum requirements in cloud and/or no backup for the battery (e.g. wood, gas heating/cooking). I’m not disagreeing with your data. I’m simply saying that there are ways to get a budget system started if people have other backup systems and do ” the washing on a sunny day”. I wanted to go off grid until I did the maths by multiplying kWs of appliances by hours used, to produce the total kWhrs a day I use for both day and night. It’s especially difficult budgeting for kWhrs when we’re green. Less green offgridders “cheat” by installing gas cooking, whereas I have an induction cooktop. In the southern states of Australia, gas heating also becomes more common. Country folk in remote homesteads who are offgridders, inevitably fall back on wood backup for heating and cooking. For a city person with limited space to go off grid, is more difficult and really needs a property wide appraisal the same as designing permaculture. Any DA for new buildings and renovations, needs to primarily consider solar access as a priority. As this article notes, it appears Mobbs chose a modestly priced inverter, rather than a highly engineered product with more extensive load management features, to make sure appliances are staggered around the solar day. Once all of that planning is done, if we don’t want to use diesel, gas, wood or grid backup, then that rests all our power backup in the battery. The cost of generation is always allot cheaper than the cost of storage, so it’s ideal to try to achieve filling a battery on cloudy days with minimal sunshine. On sunny days, the offgrid house should fill the battery by the morning and if not the generation is too small. Luckily for him (and others) the cost of batteries has come down. 6) for no planned diesel, gas, wood or grid backup, the battery is only fallback. With no backup, the battery needs to fill on cloudy days for minimum requirements. Hobbs probably did fairly well with the technology available then, though was aiming high being off grid in suburbia with limited space for solar and no wind, with no other backup other than a battery. Looking at promised PV production for March 2016 of 15.8kwh/day seems to be a reasonable assumption for a 3.5kw array facing north. Panel output however, is only 6.45kwh/day which is less than half of what it should be. There are 2 conclusions for that, 1) One of the PV strings is not working at all. 2) Orientation of the array isn’t facing north and or is subjected to shading. Going by the graph for this period he is only storing about 2.26kwh/day, no wonder the system keeps tripping out. My advise is to centre investigation on why the PV is under performing! The panels will only generate if there is a load. It looks like the household is only using about 5kWh per day, with about half of that direct-use and the other half being used to charge the batteries to their maximum limit. Apart from that, there is no load, so there is no generation. if you re-implement anything in a field where technology is improving, you either get more for the same spend, more for less spend, or the same for less spend. If you want to keep what you’ve got, you add complexity, so if he didn’t buy the right smarts in the middle he’s either replacing them to keep what he’s got with a bit more new stuff, or he’s doing a total replace. I would hazard that a complete replace is simpler, more reliable but probably more expensive than an incremental improvement. Others have said his PV is possibly right sized, and he should embiggen his battery. I think he should cost-shift things more, to right size his load against what he has, and probably avoid capex but that makes things operationally harder (dishwash at 6am? type problems) so perhaps, the goal is convenience as much as cost? Optimizing non-linear choices in a complex set of choices is hard. What are you min-maxing on this? Is it cost? is it total available power? is it capex or opex? Within the next decade, you might see equipment hire businesses renting out portable battery banks at hourly rates. The battery banks could be used to recharge home batteries in inner city areas where diesel generators are unwanted because of their noise and fumes. A portable electric battery bank? That’s called an EV and you can buy one now. In a company called Victron’s publications, somewhere I saw a mobile power system on a trailer that I think was targeted to outdoor entertainment events and so on. I think it basically had a lithium battery with generator backup. I work for Rainbow Power Company, we have been designing and selling off grid power systems for over 30 years. To meet Michael’s 5kWh/day demand in Sydney without the use of a blackup generator, we specify a 5 day battery autonomy, or ~800Ah of tubular gel lead at 48V. This replacement battery would cost him about $12,000 and would reasonably be expected to last 10 years. His solar array seems adequate, just not enough battery capacity to store the excess when it is available to ride through the occasional inconveniently timed loads and bad weather. Lithium characteristics are much better when there is a grid backup to fall back on, and then is able to satisfy most self consumption models. Full off grid without generator or grid backup is a whole other story and the lead profile is better value and more reliable. Is there a simple algorithm for households with x persons consuming energy in daytime loads ? Would you be confident to suggest (not guarantee) a generalised 5 day storage capacity would reduce grid dependence by say 95% ? There isn’t going to be one simple algorithm to do that. Energy generated by PV panels depends on your local climate. So you would need a different algorithm for each location. An algorithm would also need to know how your demand profile changes throughout the year. There can be large variations in demand profile depending on how heating and cooling needs are met. This won’t be the same for everybody. To get an idea of how the models work you can look at a simple Excel model I put together. You can download the model from a link on my Youtube site. Note that the model does not include seasonal variations in demand. If are handy with Excel you can make this modification yourself. There are algorithms of increasing complexity. HOMER energy is sophisticated software that does good modelling. Our offgrid system load profiles and sizes at RPC.com.au are based on those models. We are one of the few that transparently publishes system prices, specific components, load profile designs, and information on how to do it yourself (if your want). The number of people is almost irrelevant in system sizing. What matters are the size and frequency of the loads, eg the lifestyle. Fridges, freezers, aircon, swimming pool, dishwasher, pumps etc. In a decent sized system, lights, laptops, phones, and TVs are almost insignificant, unless left on 24/7. Anything that creates heat eg ovens, hot water, heaters, kettles, uses hideous amounts of power and is best done some other way than with off grid electricity. With full confidence I can say a 5 day battery autonomy with appropriate solar array will reduce grid dependence by 99.9% (probably more) but you are paying a lot extra for that last 4.9%. Five days of battery backup is costly. For people with less money, being modest in cloud and having backup systems like gas and wood, can help get those families started. Agreed. If you have a generator backup then 3 days of autonomy is more appropriate. If you have an auto-start generator/grid the autonomy period drops to only 1 day. This is for a robust system, if you are willing to compromise on reliability or what appliances you can run and when then you just get the best you can afford. A full off grid system when the grid is available is quite wasteful. Excess generation that could be exported goes no where, and excessive battery storage sits there unused waiting for a rainy day. 90% self generation and energy independence with backup for when the grid goes down can be had for a fraction of the price, design effort and inconvenience if you stay connected. If people have the space for the panels, how does the maths work out for super sizing the PV to still fill a modest size battery, then accepting an enormous amount of power will be lost in ideal summer conditions? Smaller battery banks have issues other than just kWh storage. For example the ability to deliver peak kW surge loads especially at low states of charge. Also the ability to accept very large surges of charge current during cloud burst events. More solar definitely helps systems, but the battery design is more than just night time supply. I’ve been checking out your great website over a few years and think i noticed you promote wind turbines slightly less. If so is there a reason and do you still do many in rural settings? Small scale wind is a logistical headache. It’s expensive, potentially dangerous and more prone to failure compared to solar. Very few sites are suitable due to turbulent air streams from nearby trees and buildings. Load dumps are required. Mechanical parts are more prone to failures requiring specialised repairs. Maintenance is required. Engineering is required. Competition and experience is limited and there is no government rebate available. It doesn’t replace an on demand backup supply like a generator. Solar is cheaper and easier. We are based in NNSW, so those in SA and Tassy with excellent wind resources might disagree. Ok cheers. Thanks for your pioneering work. Yes the PEAK load is limited depending on battery voltage and amp hours as well as battery types. If there are more than 2 people or the consumer just wants to always “flick a switch and it works” without thinking about load then they will need an on grid style peak load of a high as 20kw. You all remember that time the sun didn’t shine at all for 5 days, then shone for 3 days and nights solid to recharge your hugely over-specified lead acid batteries? Me neither. Yes there’s a longer recovery on days the battery is discharged closer to its limit and this is another reason the PV needs to be sized generously, so the battery recharges very quickly in ideal conditions and some in marginal conditions, before going into further very cloudy conditions. There’s no significant cost on going big on PV as the panels are so cheap, so if the roof space is there, it’s another great way to create a robust system, especially for those of us with the roof space there available. If people don’t have that, then it puts more pressure on paying for 5 days of solid battery backup. From experience, extra costs beyond PV, mounting, and cabling, are new charge controller(s) and upgraded DC breaker/fuses. Older off grid systems (24V) may breach amperage safety limits with PV upgrades. Extra panels (on new charge controller bus) should face east and west at 45-60° to flatten the increased noon peak PV into battery, allowing early AM (spring/autumn heat) and late PM (summer cooling) air con loads from PV rather than battery. Also general increase in winter PV. Yes. So far I’ve used Victron and their inverter/chargers (don’t have any MPPT ports like the gear you discussed in this example), so it’s all done with dedicated seperate charge controllers. My bigger buildings I’m looking to 48V. You guys are the ONLY ones i think KNOW and UNDERSTAND what 100% off grid is about. you pay too much, you lose a little money – that’s all. bought was incapable of doing the thing it was bought to do. lot – it can’t be done. The outcome was inevitable. If you don’t engage offgrid specialists you are not going to get a workable system. Even someone with many years experience in grid connect is probably going to get it wrong as they won’t have experienced the issues in going off grid and know how to avoid them. I won’t sell a system if I know the customer doesn’t have the budget for what is required to meet their needs. What is the obvious major problem with Mobbs’ system? The inverter is throwing away 1/3 of the PV power. The GoodWe GW5048D-ES inverter has a maximum PV to 48V battery charging power of 2300W. With 3.5 kW PV unless the 240V loads are 1.2 kW, the PV is lost. This problem has a simple solution: Rewire the 2 existing PV buses to 3 buses: 2 @ 1000W each into GoodWe and add a Li capable offgrid MPPT charge controller for the 3rd PV bus…. Will also help if panel shading is a problem. 11 years incrementally evolving off-grid system. v2.0: 18kWh LiFePO4 replace thirsty tired FLA @ 9 years with average 12% discharge. v3.0: (in progress) +2kW E/W panels to support 5kW RC/AC to cut wood stove use. I have a 4.5kw unshaded Trina brand solar array with a 10 degree angle optimised for skylight collection in bad weather. It has triple redundancy due dual inverters and chargers and the genset as the 3rd option giving a proven 99.9999% uptime. Gas cooking , water heating and wood heating options are essential as it’s an alpine climate Genset (3.7kw petrol) run time is 20 hours per year or 25 litres of fuel per year. Depending on weather electrical appliances do a lot of cooking too. My system relies in poor weather on infrequent 2-3 hour bursts of genset power to bulk charge with the solar panels doing the remainder of charge. This saves battery costs upfront and ongoing and is very reliable. Your use of a 12 volt system, with 4.5 kW of solar array, and a 3kW inverter means that you either have enormous 300A rated fuses and battery cables or a potential safety issue. Dual inverters were mentioned so instead of 3/9 kW that brings it down to 1.5/4.5kW each, halving cable diameter with double the number of cables. Perhaps, but even with 2 inverters if both are going, that large current could be flowing through the battery interconnects. Same with the solar. I don’t have the full picture but it sounds messy. = 51.25mm2 cable diameter for a 2% voltage drop. 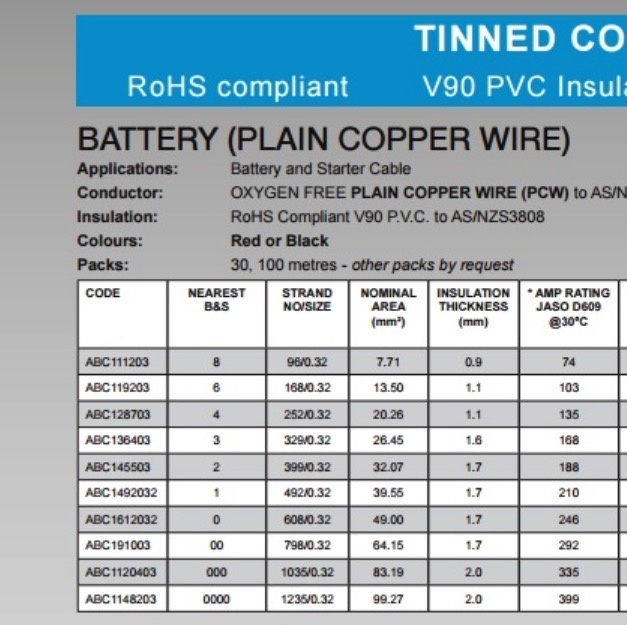 So if Phil’s achieved no more than a meter distance between the dual inverters and the battery, and provided the positive and negative leads of each inverter with 50mm2 of cable it would be about right. Auto electricians have that in stock. Voltage drop isn’t the issue, it’s current carrying capacity. 50 mm2 flexible copper in conduit is rated to a maximum continuous 189A. Any more than that and the insulation begins to melt. Oh yes, the cable is definitely looking like it’s going to be big. Even based upon this manufacturers battery and starter cable 375A needs their 99mm2. I’m an electronics tech so these cables are not my field. It can be seen why we’ve progressed to higher voltage battery banks although I’m uncertain Tesla doing 400V+ is necessary, a departure from everyone else 48V standard. I guess some of us still have legacy 12V systems. Even if people want to run 12V/24V appliances (more expensive) then 24V is the best choice to get the cable diameter down. I agree for the vast majority of people, 48V is best. Very cheap to buy at around $20 a meter. For battery isolation i use the blue sea brand (marine) isolators rated at 400 amps continuous and protect with a DC magnetic hydraulic 300 amp Circuit breaker . Based on us poking a stick at your system, sounds like you’ve done your research well. I admire your efforts. There’s some guys on here doing the latest and most evolved kit and I think there’s encouragement to upgrade to 24V or 48V, perhaps when one of your 12V inverters finally gives up. The leftover one could make a fantastic install in a mobile install or another smaller building. I think it depends upon if your running any 12V/24V appliances. As OrionMan777 is highlighting, the cost of the solar controllers etc reduces relatively to the strings of PV kW we’re using. The budget was $8k all up . And that even meant sourcing 18 x new Trina 250w panels for $135 each at a clearance sale. Awesome. I’m doing a similar thing with a few buildings. Endeavouring to have three systems and one grid connection. Yep induction cooktops are so good, easy to clean, as fast as gas. Fantastic price on your panels. 12V = 375A and the cable needing to be at least 50mm2 to keep to the 2% voltage drop and to carry the current it needs to be a greater 99mm2 with the manufacture’s cable below. 24V = 187.5A needing 25mm2 for the 2% voltage drop and at least 32mm2 for the current carrying capacity. 48V = 94A with 13mm2 to keep to the 2% voltage drop and at least 13mm2 for the current carrying capacity. We’re only talking a meter of distance between the inverter and battery, though the costs of fuses and disconnect switches goes up. A big difference in cost is the same solar controller that can work to a 12V, 24V or 48V battery voltage, has less kW of PV it can handle, as the voltage of the battery goes down, and the current goes up. So the solar controllers are cheaper for the higher battery voltage. Inverters are the same cost, though larger ones progress to the higher DC voltages and 48V models appear to be getting more common and cheaper. These guys are doing the math and competing for the work. 3 phase is affordable now too. Thanks for the referral. Site looks well organised with lots of info. Are the prices on their site somewhere? I currently use a brand called Victron which also has extensive information online and they are designed in the Netherlands and made in China I think. They’ve been going since 1973. More coming into the Australian market soon. My Batts i keep to a charge current of no more than 120 amps and the house “ticks” over using 20 amps , plus the Yum Cha inverter is pretty inefficient and uses 7amps even on a light load. I do the same approach as you, buying seperate MPPT and inverter/charger rather than getting devices integrated into one solution. I get paranoid if something breaks, I don’t want everything falling over at one time. And when it’s our own gear, I’m sure everyone probably goes full custom. I’m not into storage solutions either and prefer batteries. All this other stuff must surely be for marketing. I like something I can test and understand rather than a “black box” device. Also like the way you’ve got dual inverters and dual MPPT’s. At least half your system will always be operating. Little more expensive though reassuring features for someone like yourself out in the sticks (Alpine) environment. Can you email me at smvgaleatgmaildotcom, I’d like to talk you further about your experiences. Cheers. For standalone nothing beats more panels, only more panels. You need to collect enough power every day to charge your batteries from the night’s use and supply day loads. Its that easy. And good gear wins hands down, Selectronic, Midnite, there are more too, but this is what I have. Buy poor quality and you will buy again. Size? I use 30kw a day standalone when the sun shines, I heat water with 1kw all day and process used cooking oil for fuel. Overcast at worst I will get 12kwh in, so I adjust my use accordingly, but there aren’t very many 12kwh days with 20kw of panels. My system is all self installed and has grown over the years, I too started small, I remember being over the moon with 1000 watts of panels and an SA30. I now have 4 Midnites and both 24 and 48v systems with 3,000ah of batteries. Most of my gear is preloved, 5kw PS1 on 24v with same SA30 for nite use, and two SEA 3.6kw inverters on 48v for heating water and processing oil. There is no secret to standalone, there is only one rule to it, more panels is better, never a day goes by that my batteries don’t fully charge, and they reach that state early in the morning. I never have to worry about battery state of charge, they always are (charged). So, where to from here, ahhh, more panels, and I have another 7kw of cheap used panels ready to go up, this will take me to 28kw, only another two and I will have 30kw. Currently 48 x 250w and 45 x 190w panels, another 7kw will take me to 121 panels. So you can do all the sums and calculations you want for all you clever blokes with calculators, but I can tell you that 20kw is the minimum you need to replace the grid all rear round in southern latitudes, because I have been thru it all from one kw to 20 (21 to be exact) and it is only now that I do have enough power to be totally extravagant with it. I had 13kw for a couple of years and that wasn’t enough. Calculations aren’t as accurate as doing it in real life and seeing the results day to day, year round. My location? Portland in Victoria. Well near Portland, hard to have 100 panels in town. And if you are familiar with our winters, we have a lot of overcast weather. A word on Midnites, they have two highly configurable AUX outputs that automatically control excess power use, they are the brains of my system, they are the best MPPT charger around without doubt. You don’t need a smart inverter with Midnites.